When Negros Navigation celebrated it’s Diamond Anniversary in 2007, it issued an anniversary book. Going through the book, the reader might think that all along Negros Navigation was a great liner company. Unfortunately, that was not the case as Negros Navigation started as a shipping company linking just Panay and Negros and this was true even after World War II or nearly three decades after the company was founded. This would also mean that some shipping companies were the main connection of Western Visayas to Manila before Negros Navigation took that role. Filipino shipping companies came to the fore in the early1930’s when it was becoming clear that a preparatory period for independence was coming. Filipino businessmen then thought they will supplant the then-dominant American businesses here when independence will come (nobody then can anticipate the “Parity Amendment” which came together with our independence). In the Commonwealth period, the dominant Western Visayas shipping company was the De la Rama Steamship. Don Esteban de la Rama of Iloilo was a very wealthy businessman and very well-connected politically as he himself was a Senator of the land and Vice-President Osmena was his brother-in-law. In this period, De la Rama Steamship ordered brand-new liners from Germany and those were the best in the land then and comparable to foreign liners. Like many other shipping companies, De la Rama Steamship lost their liners during the war and after the war they were recipients of reparations by the Americans which promised replacement for the comandeered liners during the war. They also had some new-builds ordered from Japan which became the bone of contention later. In a few years, however, De la Rama Steamship concentrated on foreign trade and gave up their local routes. After the war, there was another shipping company that served as the main connection of Western Visayas to Manila and this was the Southern Lines which was founded by rich businessmen of Western Visayas which belonged to the upper crust of the society of that region. Southern Lines operated converted former “FS” ships like many shipping companies of that era and it concentrated mainly in linking Iloilo and Bacolod to Manila. This company did not expand to other regions like what Negros Navigation did later. Negros Navigation became a liner operation from being a regional when they and Ledesma Lines merged in the late 1950’s. Before this it was Ledesma Lines that had routes to Manila. This merger was the reason why the Ledesma family held substantial holdings in Negros Navigation for several decades until they sold off when they didn’t agree with the national expansion plan of Daniel “Bitay” Lacson in the 1990’s. Southern Lines went out of operations in the mid-’60s and they sold off their ships but it did not go to Negros Navigation. I am not sure if there was a sell-out of routes to Negros Navigation but it will not really matter then as getting routes was easy for the company as their ownership which also belong to the upper crust of Western Visayas society was very close to President Ferdinand Marcos then. I am of the mind, however, that the demise of Southern Lines might be an orchestrated move to pave way for the rise of Negros Navigation. The ownership of the two shipping companies are related by kinship and marriage and I think it was obvious which company had the blessings of Malacanang. And actually there is an indirect proof that Negros Navigation already controlled Southern Lines before its demise. Negros Navigation as a new liner company built up its fleet not by buying surplus ships but by ordering new, purpose-built liners from Hongkong first and then Japan. 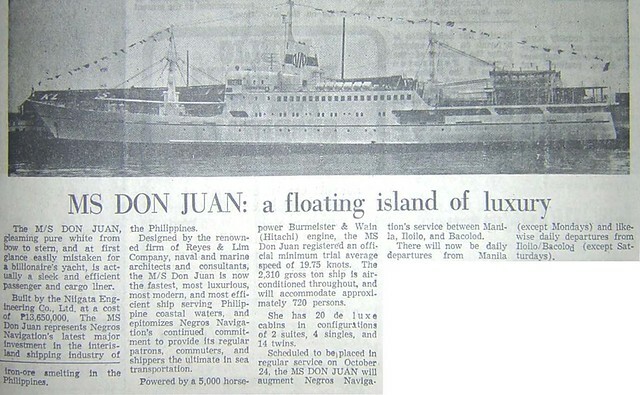 Their first brand-new liner was the “Princess of Negros” which was built by Hongkong Whampoa in 1962. This was cruiser with the external dimensions 61.0 meters by 9.5 meters with the cubic dimension 493 gross register tons. The ship had a net register tonnage of 301 tons and a DWT (deadweight tonnage) of 188 tons. These dimensions were almost like that of an ex-”FS” ship but actually she was even a little smaller. She was speedier though because she was powered by a 1,920-horsepower B&W Alpha engine whose power was almost double that of an “FS” ship and so she was capable of 13 knots sustained. The passenger capacity of the “Princess of Negros” was 349 persons divided into several classes from Economy to Suite in three decks. The ship’s ID was IMO 5284974. The next new-build liner of Negros Navigation and the others that followed after it was from Japan. This was the “Dona Florentina” which came in 1965 and she ushered the “Dona” series of Negros Navigation. She was built by Hitachi Shipbuilding & Engineering Company in Osaka yard, Japan. The ship measured 95.7 meters by 13.9 meters with a gross register tonnage of 2,095 tons. She was powered by a single 4,400-horsepower Hitachi engine and her design speed was 17.5 knots. This ship’s permanent ID was IMO 6515899. This ship was already part then of the trend of building liners with airconditioning with a length of just short of 100 meters and with 2,000-gross register tons size, a speed of approximately 18 knots and passenger capacity of just below a thousand. During this time this was what was considered then as a “luxury liner”, taken in their size, speed, accommodations, food and passenger service. The “Dona Florentina” can be considered as the first luxury liner of Negros Navigation and she had a passenger capacity of 832 in a net tonnage of 1,015 and a DWT of 1,425 which was the load capacity. A sister ship of hers followed the “Dona Florentina” in 1967. This was the “Don Julio” which possessed more beautiful lines and this ship was considered the beauty of her time. She has the same external dimensions as “Dona Florentina” but her cubic capacity was 2,116 gross register tons (this later rose to 2,381 tons), a net register tonnage of 1,111 tons and a DWT of 1,425 tons. The “Don Julio” has the same engine and speed of her sister ship but her passenger capacity was higher at 994 persons. The ship was not built by Hitachi Shipbuilding but by Maizuru Shipyard in Maizuru, Kyoto, Japan. Her permanent ID was IMO 6728549. Another brand-new ship from Japan, the “Don Vicente” arrived for Negros Navigation in 1969 and she was mainly used for the Iloilo-Bacolod route. However, this ship was bigger than the “Princess of Negros” at 77.4 meters by 12.0 meters. Her gross register tonnage was 1,964 tons and her net register tonnage was 493 tons with a DWT of 576 tons. The ship was built by Niigata Shipbuilding in Niigata, Japan and her permanent ID was IMO 7003763. The “Don Vicente” was actually bigger than the converted former “FS” ships, even the lengthened ones, which was the common liner of the era. She was actually faster too at 17 knots which came from a pair of Niigata engines (this was the first-twin screw new ship of Negros Navigation) of 4,000 horsepower total. It would not have been a shame if she was fielded as a liner to Manila but the rich of Western Visayas also wanted a good, exclusive ship for the Iloilo-Bacolod route. In 1971, a sister ship of “Dona Florentina” and “Don Julio” came from Japan, the “Don Juan” which then became the flagship of Negros Navigation until 1980. She, too, was built by Niigata Shipbuilding in Niigata, Japan. She measured 95.7 meters by 13.8 meters and that was near-identical to her sister ships. Her cubic volumes in gross register tonnage and net register tonnage was 2,310 and 1,330 tons, respectively, and her load capacity in DWT was 1,372 tons. This ship was faster than her sister ships because she was powered by a 5,000-horsepower B&W engine which gave her a sustained speed of 19 knots. Like her sisters ships she had accommodations from Economy to Suite but her passenger capacity was only 740 persons when her net register tonnage was higher and that means she has more space total and more space per passenger than her sister ships. She had the permanent ID IMO 7118088. In 1971, when the “Don Juan” arrived, the economic crisis of the country was already deepening and this can be seen in the free fall (called “floating rate” then) of the peso which meant devaluation. With devaluation, the imported goods became more expensive in peso terms which means for the same thing like a same ship, the shipping company has to pay more. With this the ordering of new ships from Japan by Negros Navigation stopped. But in their fleet they already had five brand-new ships which was enough for their limited routes to Western Visayas and their Iloilo-Bacolod route. In 1976, Negros Navigation will add a 10-year old second-hand ship, the “Don Claudio” which became the biggest ship in the fleet by a small margin. And in 1980 they will acquire their first RORO liner, the “Dona Maria” which was then a 7-year old ship. However, in external dimensions she was just as big as the “Don Vicente” and in design speed she was the slowest at 15 knots save for the first brand-new ship, the “Princess of Negros”. Negros Navigation sold to Southern Lines the liner they inherited from Ledesma Lines (and Southern Lines sold their old ships to other shipping companies). This was an earlier “Don Julio” which was a re-engined ex-”FS” ship. That means Negros Navigation had the newest fleet since the late ’60s when it was already able to build a fleet of their own. And by reckoning, they still had the newest ships up to the early ’80s, definitely, and most likely up to the second half of this decade. That was what they earned by buying new ships when the competition was still dependent on ex-”FS” ships of World War II vintage. In the ’80s the other shipping companies were already shedding their their former World War II ships. From thereon all the shipping companies were purchasing surplus ships from Japan built in the late ’60s to the early ’70s, the same age now of the Negros Navigation cruiser ships. When they started acquiring RORO liners it was more or less of the same age and so no company can claim their fleet was younger. With great devaluation it was already suicide for shipping companies to order brand-new ships. It was simply unaffordable by that time already. But for a while, for some two decades, Negros Navigation can claim outright they have the youngest liners in the country.